Pleasanton Oaks needs your help! You have cleared the town of Pleasanton of the Time Sentinels, but a new threat has emerged in the sleepy suburb of Pleasanton Oaks. Journey to Pleasanton Oaks where all the citizens have gone into hiding from the Sentinels. 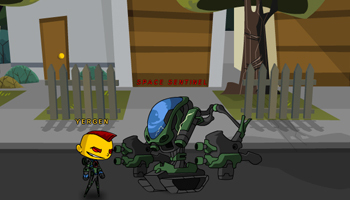 Clock Blocker's Space Sentinels have overtaken suburbia and only pets are allowed outdoors. 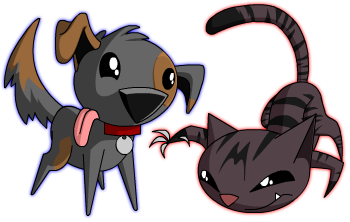 Here you will meet Deeoohgee the super good pup, and General Fluffles the super evil kitty cat! Both cuddly critters will send you on quests throughout Pleasanton Oaks as you get one step closer to blocking Clock Blocker's plans! Two, fully animated cutscenes help the story unfold, and include a special guest star. George Lowe! That’s right; AE’s favorite voice lends his to HeroSmash for the first time. Oh, and don't forget to look for Ghouldo! Dumoose added him into the map, so you'll have to look close. PumpCON 2011 Starts next week! Now that we officially have a name for it, next week kicks off HeroSmash’s first ever PumpCON! Defeat Vile Vegetables and one Wicked Wolf man. Collect candy for the Boo brothers, and they will in turn reward you with some hauntingly good items. 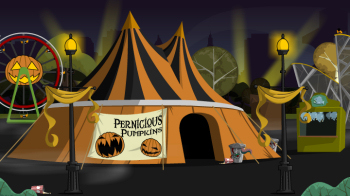 So get your pencils, paper, tablets, and photoshop ready and prepare to bring on the PumpCON! AE’s third annual pumpkin carving contest is kicking into gear as well. So all of you HeroSmash fans out there grab a pumpkin and get carving. Let’s see some HeroSmashed Squashes! Enter your submissions HERE.